A game of golf, even a bit of range practice, is hard to fit into the schedule of our busy lives.So try this! Next time you're waiting for: a train, bus, plane, the slow foursome ahead of you on the fairway, in the car waiting for your spouse to finish shopping, on a 10 minute break at your job, reach for your cell phone, bring up the GOLFLiX App and take a golf lesson while you wait. See, and feel the smoothness of Luke Donald's hitting his driver, absorb the beautiful rhythm of Corey Pavin's full swing motion. These images will be assimilated, stay with, and become part of you when viewed repeatedly. It's like a song you just seem to be able to sing, because you've heard it so many times. Next time you're having a bad range day, and getting more frustrated by the minute. Try this: STOP! Step back, take a few deep breaths. Go to your GOLFLiX Appand watch the beautiful unhurried rhythmical swing of Aaron Baddeley, or maybe the wonderful way that Se Ri Pak turns her shoulders during her swing sequence. After watching the inspiring action and form, with those images still fresh in your mind, go back to hitting balls imitating what you just watched. Now pretend you are Aaron or Se Ri, just as you might have when you were a child. We guarantee this will help you to hit better golf shots. Remember, as children, this is the way we learned how to play all sports ......... by WATCHING AND IMITATING! or radical concepts, rather ironically in this advanced digital age, it is the most primitive of instructional methods. The foundation is simply, "MONKEY SEE, MONKEY DO " or …… VIEW IT andDO IT ! Watch a Pro ... Feel like one! 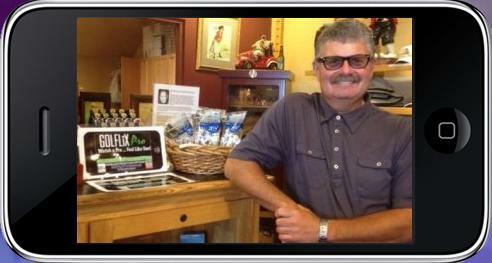 Blast Applications.com presents the unique new iPhone / iPad / iTouch App called GOLFLiX PRO(GOLFLIXProfessionals) that teaches you the golf swing through the powers of visualization. The technology is new but concept is absolutely primitive ! Through a full library of videos containing the swings and personal tips directly from the PGA & LPGA Pros themselves, the user watches repeatedly the sequence of body movements that create a winning golf swing. After watching over and over, the user begins to assimilate those visual images and can recall them in the minds eye, enabling the viewer to recreate what he or she is visualizing. This is not unlike a song one seems able to sing after listening to repeated play on the radio. The first installment is out now featuring the first 6 of many PGA & LPGA stars who will be participating in this program. Among this first group of Pro Champions are 3 US Open winners, a Hall Of Famer, a PGA Champ, and a fast rising PGA star with the charisma of a rock star. This App also makes a great gift for that certain golfer in the family who seems to have everything such as: The cute animal head covers, The monogrammed balls, The fake 'Greatest' trophy the new 'super long driver' , etc. Now you can give them something they can really use .... a GOLF SWING ! GOLFLiXPro continues to have great finishes in the PGA & LPGA tournaments.Ernie Els won his second British Open (his first one came in 2002) by coming from behind to best young super star Australian golfer Adam Scott. The classic swings of Ernie and Luke Donald, who placed in the top five, are very much alike in their absolute perfection of tempo, rhythm and form. You can learn so much by simply watching watching these two champion's over and over. Their action will assimilate and enable you to call up that image on the course when you need it. That is the essence, the basic core concept of the GOLFLiX Pro iPhone App. This convenience of watching this imagery anywhere, anytime, and being able to make a deposit in your imagery memory bank will prove invaluable in your pursuit of the ever elusive quest to find one's golf swing. Imagine daydreaming about golf on a plane, bus or a train, thinking you'd like to just take one more quick look at Luke Donalds perfect finish, or what position his head stays in throughout the entire swing. All you would need to do is open your GOLFLiXPro App on your iPhone - pick the golfer want to view, and watch his swing in the palm of your hand. One great way to utilize the GOLFLiXPro Application now available in the App store on your iPhone. The one described in this article is a basic one that not only applies to golf instructors as is the focus here. There are many more uses for the App. Paula and Se Ri. Bet they wish they could have studied their idols by simply reaching into their pockets and pressing a button. Such is the gift of GOLFLiXPro.